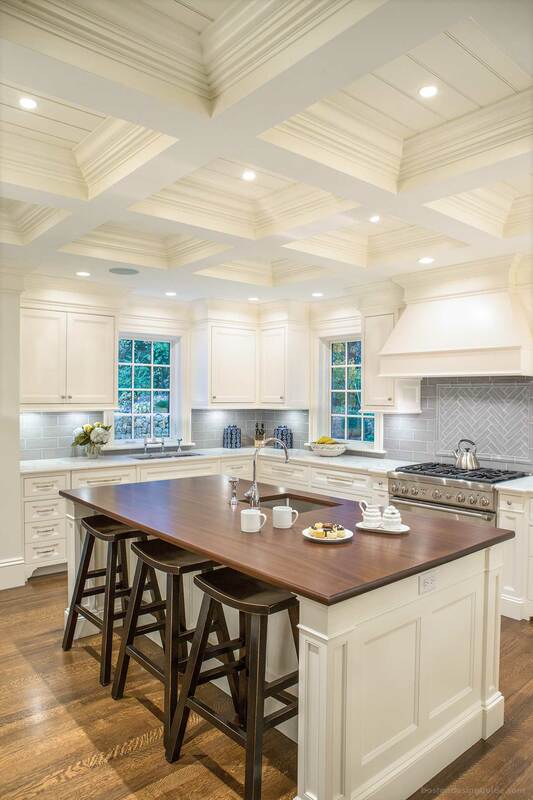 When it came to the millwork of his new house on a quiet street in Wellesley, Peter Fallon, founder of Fallon Custom Homes & Renovations, went deep. We wouldn’t expect anything less from the high-end custom builder with his own in-house cabinetry and woodworking shop. Last fall, he welcomed us into the stately new build he had just completed, and we were greeted by layers of fine cabinetry, gleaming oak hardwoods, antiques, art and a soft gray palette. While Fallon can often be found in his third floor lair, with its oversized TV and comfortable chair, the kitchen is his favorite space in the house. He loves the room’s symmetry, while we were taken by its luxurious cream-colored coffered ceiling that contrasts nicely with the rift and quartersawn white oak floors in a Jacobean stain underfoot. The kitchen is homey but refined, with a furniture feel that stems from paneled appliances, the island’s mahogany countertop and the legs of the cabinetry. The space is emblematic of what Fallon's millwork shop can do—throughout a home.